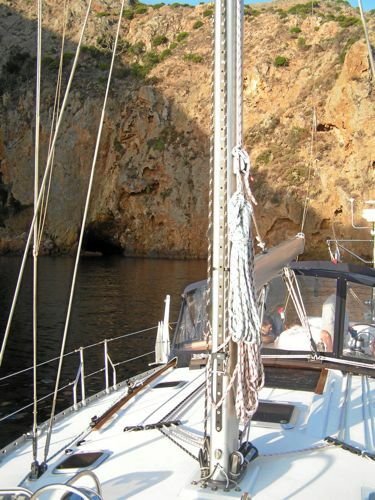 Sheltered by steep cliffs, this spot appears immune to “canyon winds,” the off shore winds that sometimes rip down the island’s river valleys and make you wonder if perhaps you should have paid out a bit more rode at the stern. 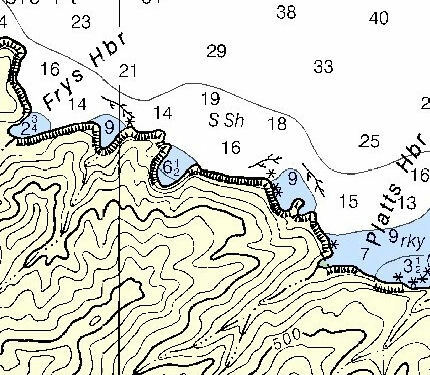 The anchorage is fairly well sheltered from both west wind and the accompanying swells; however, it is deeper than most other Santa Cruz anchorages (50 to 60 ft. rock and sand) and has no beach. You rarely see boats here, but that is because Frys gets most of the traffic. We were “forced” to anchor here because Frys was full. Lucky for us. We now know that this is a superior anchorage in several ways: quiet, secluded and comfortable; however, it is not provide as secure a refuge from high west wind and swell that Frys affords. While we spent a fairly calm night, we did experience an occasional ship-rolling swell that we attributed to traffic in the coastwise shipping lane. 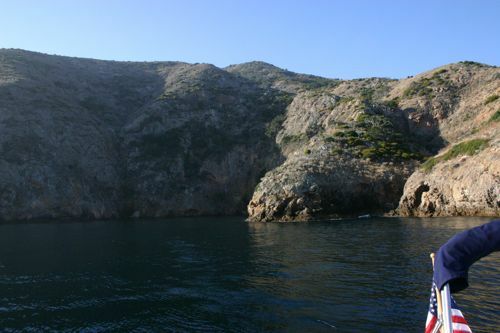 The Grotto is the second cove east of Frys, which is in easy kayak range. 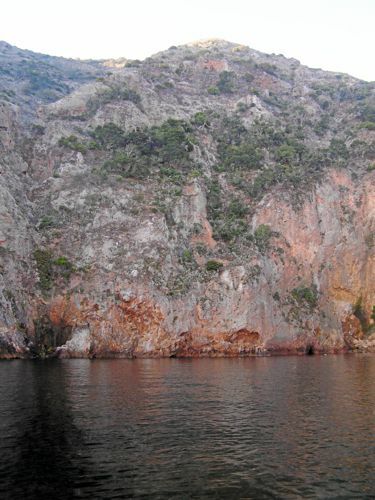 The Grotto has a large finger extending on the west side and an outcropping of rocks along the base of a cliff. There is also a sea cave in the middle of the south wall of the canyon. We entered the anchorage from the southeast, keeping a safe distance from the rocks. We made our turn west (upwind) about half way into the anchorage then headed up to the point at the west entrance of the anchorage. With the west finger abeam, we dropped our bow anchor in approximately 50 ft. of water. Letting out plenty of scope, we still found ourselves dropping the stern anchor in about 35 ft. of water. It’s a very narrow spot and we set our anchor alarm at the minimum setting and checked for movement at least every hour during the night. 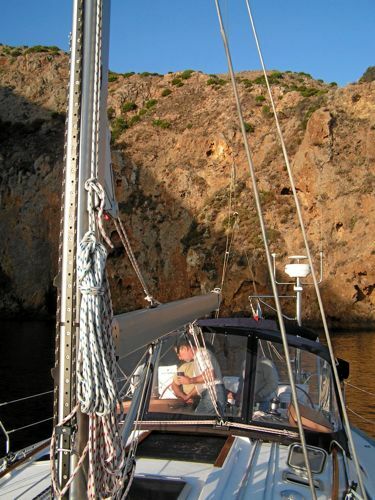 This anchorage definitely requires both a bow and stern anchors for anything longer than a very short stay. Even then, I would keep an extremely vigilant eye out as the cliffs and outcroppings of rocks are most unforgiving at very close at hand. 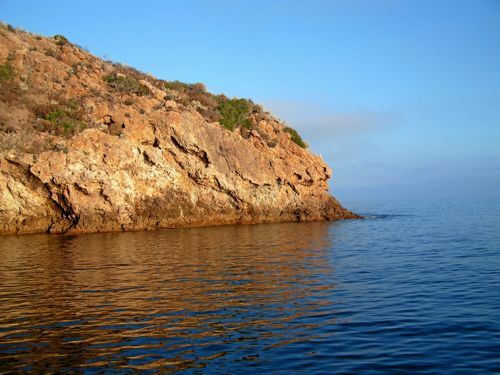 There is a fairly prodigious outcropping of rocks at the eastern entrance to the anchorage. Extra care must be taken approaching them as a modest current and swell can push even a large vessel dangerously close to them. In addition, beware of fouling your anchor(s) on the rocky bottom. We employed an anchor buoy, rather ineffectually as it was 10 ft. underwater as we underestimated the depth. If you intend to go ashore, you’ll need a landing permit.